Jim Lee (born August 11, 1964) is a Korean American comic book artist, writer, creator and publisher. He is known for his stylized, detailed and dynamic style and is one of the more popular artists in American comics. He has received a great deal of recognition for his work in the industry, including the Harvey Special Award for New Talent in 1990. The Punisher War Journal 18 cover by Jim Lee. Lee was born in Seoul, South Korea, but grew up in St. Louis, Missouri. Lee's St. Louis Country Day School classmates predicted in his senior yearbook that he would found his own comic book company. But, initially, Lee seemed resigned to following his father's career in medicine. Lee attended Princeton University and majored in psychology with the intention of becoming a medical doctor. An elective course in Fine Arts reawakened his love for drawing; he graduated in 1986, putting medical school on hold to attempt a career in comic book illustration. Jim Lee is not related to Stan Lee or Jae Lee, two other prominent names in the American comic book industry. Lee is cousin to TJ Moon, creator of Holy Laughter. After inking only the cover of Samurai Santa #1 for a small, independent publisher, Lee found success at the North American comics publisher, Marvel Comics, as a penciller. His early Marvel work included Alpha Flight and Punisher War Journal. In 1989 Lee filled in for regular penciller Marc Silvestri on Uncanny X-Men #248 and did another guest stint on issues #256 through #258 as part of the Acts of Vengeance storylne, eventually becoming the series' ongoing artist as of #267 when Silvestri left. During his stint on Uncanny Lee first worked with inker Scott Williams, who would become a long-time collaborator. Cover art from X-Men #1 by Jim LeeLee's artwork quickly gained popularity in the eyes of enthusiastic fans, which allowed him to gain greater creative control of the franchise. In 1991, Lee helped launch a second X-Men series simply called X-Men, not only as the artist, but also as co-writer with long-time X-Men scribe Chris Claremont. They created Gambit aka Remy LeBeau. Lee also designed new uniforms for characters such as Cyclops, Jean Grey, Rogue, Psylocke and Storm, creating the Images that an entire generation of X-Men readers would associate with the characters. He also co-created the once-popular character Omega Red with John Byrne. X-Men #1 still is the best-selling comic book of all-time with sales of 8 million copies of the first issue, although multiple purchases of variant covers illustrated by Lee accounted for part of the sales frenzy. However, Lee ran into some creative hurdles. Claremont found it harder to work with Lee as their vision of the characters and storylines diverged. There was a prolonged power struggle over the future of the X-Men and in the end, Marvel X-Men editor Bob Harras favored the wildly popular Lee, causing Claremont to depart the new X-Men series with issue 3. Despite this, Claremont and Lee later reunited on various projects and are reportedly on friendly terms. Claremont and Lee even engaged in a mutual interview for Wizard magazine in 1995. WildC.A.T.s promotional artwork by Jim Lee. In 1992, Lee was one of seven artists who broke away from Marvel to form Image Comics. Lee's group of titles was christened Wildstorm Productions and published Lee's pet title WildC.A.T.s, which Lee pencilled and co-wrote, and other series created by Lee sharing the same "universe", but with a minor implication of the artist in his production. The other main series of the initial years of Wildstorm, with characters created by Jim Lee and with a minor participation of the artist in his production were Stormwatch (Lee was co-plotter of the first 8 issues and cover artist for the 3 first issues), Deathblow (pencils for about 30-40 pages of the firsts chapters, and plots and covers for the first 12 issues ongoing series) and GenÂ¹Â³ (co-plotter for about 3 years and penciller of 2 issues). 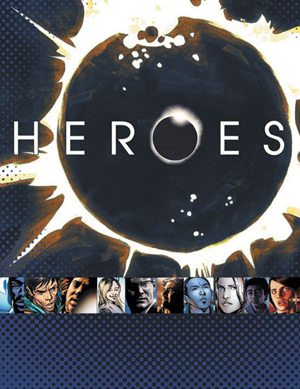 Later, other ongoing series of the same universe were launched with little to none participation of Jim Lee in his production, like Wetworks (created by Whilce Portacio, but sharing the Wildstorm Universe created by Jim Lee), DV8 (a Gen13 spin-off), Backlash (a solo title of a StormWatch character) or Grifter (solo title for a main WildC.A.T.s character), and several mini-series, most notably Team 7 (that ties together characters from WildC.A.T.s, StormWatch, Gen13, Deathblow and Wetworks). Like most Image properties, these series were criticized for high levels of violence (although they were no more violent than the usual Marvel or DC comic at the time), sexual references, and for emphasizing flashy art over storytelling. Despite such claims, Lee's stable of titles sold well, often exceeding a million copies per month in the early going, charting new highs in sales from an independent publisher. Fantastic Four #1 (1996) cover by Jim Lee.As publisher, Lee later also expanded his comics line creating two publishing imprints of Wildstorm, Homage and Cliffhanger (that years later merged and were replaced by a single Wildstorm Signature imprint), to publish creator-owned comics by some selected creators of the US comics industry. Initially, Homage was a more writer-driven imprint, debuting with Eisner Awards winners Strangers in Paradise and Kurt Busiek's Astro City. Cliffhanger was initially an artist-driven imprint, created to publish the works of three young "hot artists" of the time, J. Scott Campbell's Danger Girl, Joe Madureira's Battle Chasers and Humberto Ramos ' Crimson, three series that were top sellers for the industry. Lee and Rob Liefeld, another Marvel-illustator-turned-Image-founder, returned to Marvel in 1996 to participate in a reboot of several classic characters; the project was known as Heroes Reborn. While Liefeld reworked Captain America and The Avengers, Lee plotted Iron Man and wrote and illustrated The Fantastic Four. Lee managed to catapult Fantastic Four and Iron Man to the top of the sales charts, although fan reaction to this revamp of such well-known characters was mixed. Halfway through the project, Liefeld was fired from the project (poor sales - relative to Lee's output - were cited) and Lee's studio finished all four series. At the end of the one-year deal, Lee and Marvel agreed to hand the books over to other creators. Lee then concentrated in the Wildstorm line, attempting to break away from the stereotype of Image comics as all style and no substance by publishing critically acclaimed series' The Authority and Planetary. In publishing Alan Moore's America's Best Comics line, Wildstorm brought arguably the medium's most critically acclaimed writer back into mainstream publishing after almost a decade of independent work. Lee himself wrote and illustrated a 12-issue series called Divine Right, in which an internet slacker inadvertently manages to download the secrets of the universe, and is thrown into a wild fantasy world. Lee's depiction of DC Comics' Superman and Batman. In late 1998, however, Lee left Image Comics and sold Wildstorm to DC Comics. Lee's career as a publisher had mostly precluded art jobs and he desired to return to his roots as an illustrator. In 2003 he collaborated on a 12 issue run on Batman with writer Jeph Loeb that became a runaway sales success (See Batman: Hush). 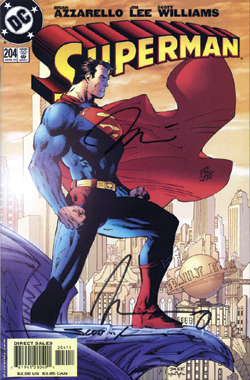 This was followed by a year's stint on Superman (see For Tomorrow), with writer Brian Azzarello. In 2005, Lee teamed with Frank Miller on the new series All Star Batman and Robin, the Boy Wonder. Lee continues to run the company he founded, working side by side with new artists. Notable former WildStorm artists include J. Scott Campbell and Travis Charest. In September 2006, Jim Lee returned to WildC.A.T.s with Grant Morrison as the writer. Lee plans to pencil both WildC.A.T.s and All Star Batman and Robin, completing an issue of each every 6 weeks, as Lee claims he will not leave the Batman title until Frank Miller has finished his run on the series. He also drew alternate cover art for the Infinite Crisis series. It has also been announced that Jim Lee will be involved with the upcoming DC Comics MMORPG as Executive Creative Director. Intense fan speculation surrounds the announcement in 2004 that Lee might team up with legendary comic writer Alan Moore for a project titled Comet Rangers, although it appears current commitments may have postponed or canceled this project. Uncanny X-Men #248, 256-258, 267-277 (Marvel, 1990-91). Fantastic Four (Heroes Reborn) #1-13 (Marvel, 1996-97). Divine Right #1-12 (Image/Wildstorm, 1997-99). Batman #608-619 (DC Comics, 2002-2003). Darker Image (Image, 1993) & Deathblow #1-2 (Image/Wildstorm, 1993). Lee draws three short stories featuring the character Deathblow, in a Sin City-like style. Gen 13 #6-7. A 2-issue story set in Italy (later collected in a Gen 13: European Vacation prestige one-shot), country that Lee visited previously as guest in a comic convention. Later in his career, Lee lived several months at Italy. WildC.A.T.s/X-Men: The Silver Age (Marvel/Image, 1997). Second of four one-shots crossover between WildC.A.T.s and the X-Men, each one in a different moment of their history (The Golden Age, The Silver Age, The Modern Age & The Dark Age). This isse is a Grifter and Jean Grey story, set in the early years of the original X-Men (when the team was Cyclops, Beast, Angel, Iceman and Jean Grey), with Nick Fury as a guest star. StormWatch #47 (Image/Wildstorm, 1997). During the Warren Ellis run in the title, Jim Lee drew a stand-alone story using only splash-pages, trying to bring attention to the series (little after, the series was relaunched with as StormWatch Vol.2 #1). Flinch #1 (DC/Vertigo, 1999). Lee drew an 8-page short story, where works in a new and more "clear" style, that later was used in the flasbacks scenes in his Batman: Hush storyline. Just imagine Stan Lee with Jim Lee creating Wonder Woman (DC Comics, 2001). Coup d'etat: Sleeper (DC/Wildstorm, 2004). With writer Ed Brubaker. First of a 4-part "event" in the Wildstorm Universe.